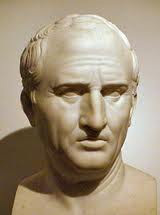 Cicero 106 - 46 B.C. "The budget should be balanced, the treasury should be refilled, public debt should be reduced, the arrogance of officialdom should be tempered and controlled, and the assistance to foreign lands should be curtailed lest Rome become bankrupt. People must again learn to work instead of living on public assistance." My Friend Ray MacEdwards sent this to me, and it has so much significance that I just had to blog it. The actual quote is: "The arrogance of officialdom should be tempered and controlled, and assistance to foreign hands should be curtailed, lest Rome fall."